Now I have Morphy Richards Chopper with me which can ease my cooking and let me prepare gravy based curries... Yippie... I am gifting that one for myself.....Yay..
Coming back to the header reflecting on my blogpost. I've had enuf disasters with Jeera Rice. Yes.. it was terrible... 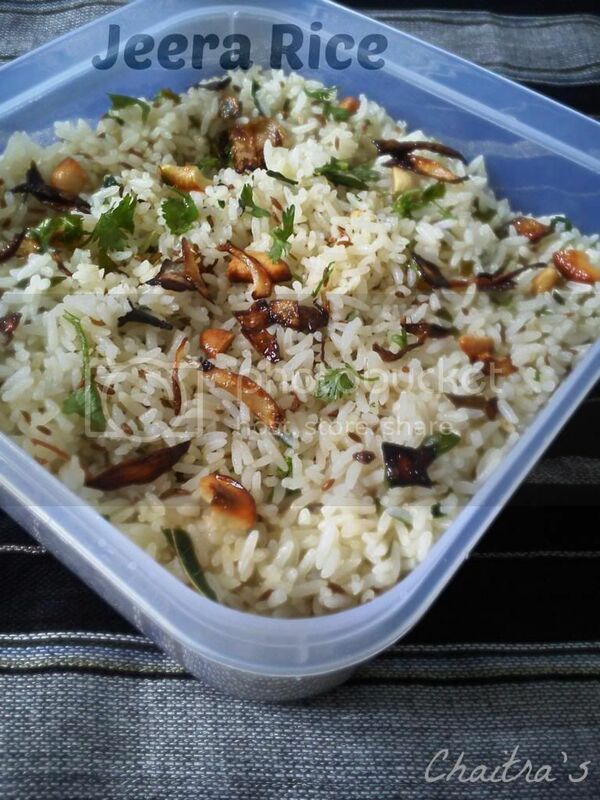 The one I am presenting to you was perfected after 4 futile attempts...Lot many blogs have Jeera Rice recipes and they have 2 different versions to prepare the same. One involves dumping everything into the rice cooker and allowing it to cook and the second one involves doing everything individually. I tried the first one and this was mentioned on Sanjeev Kapoor's website and many other blogs... unfortunately.. it became too mushy and wasn't even palatable when I followed the procedure. Second & third were kind of ok..ok. But this one was the best and perfect.. it just tastes like the one you have in restaurants that serve North Indian food. Here we go with it. Coriander- 1 tbsp chopped finely. Heat oil-ghee mixture in a pan and fry all the spices for a min or two. Be careful that you do not burn them. We just need their flavour but not their bodies (:-P). Take another pan and deep fry onions until golden brown. We need them for garnishing and don't have any role to play till the end. In the same pan where you are frying the spices, add curry leaves along with green chillies and fry for 1 min. Now add jeera to it and saute this entire mixture for 1 and 1/2 min. Your flame should be low or sim (Indian terminology). Add salt to this jeera mixture and finally add rice. Combine all the ingredients well by adding cashews and coriander. 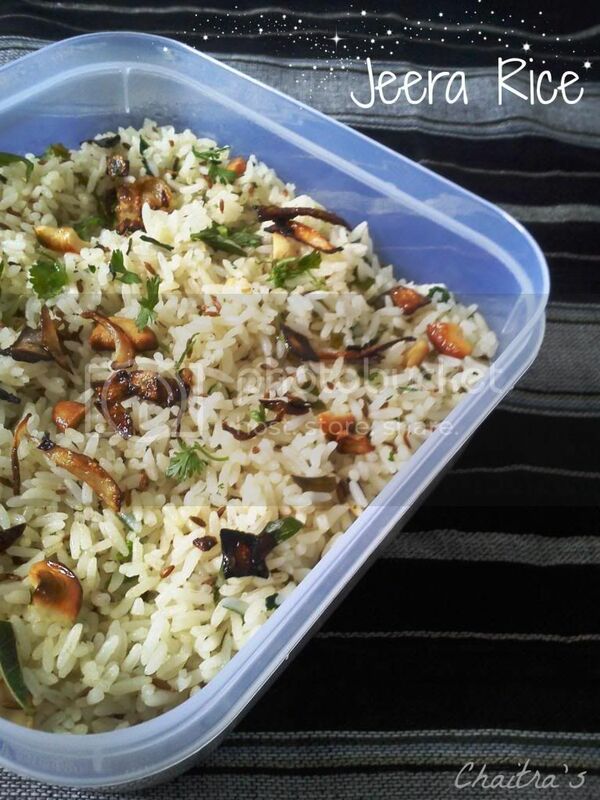 Fry this rice mixture for 4-5 mins and your rice will be slightly brown and you will nice flavor emanating. Transfer the contents onto a serving bowl and garnish with cashews, chopped coriander and fried onions. 1)Google and you will find many recipes where you can fry this Jeera mixture in advance and cook it along with rice (1 cup rice with 1 and 3/4th cup or 1 and half cup of water). Once rice is cooked, you can fork it to separate the grains. This method will ensure that rice picks up the spice flavors and enhances the taste. For me this method didn't work. 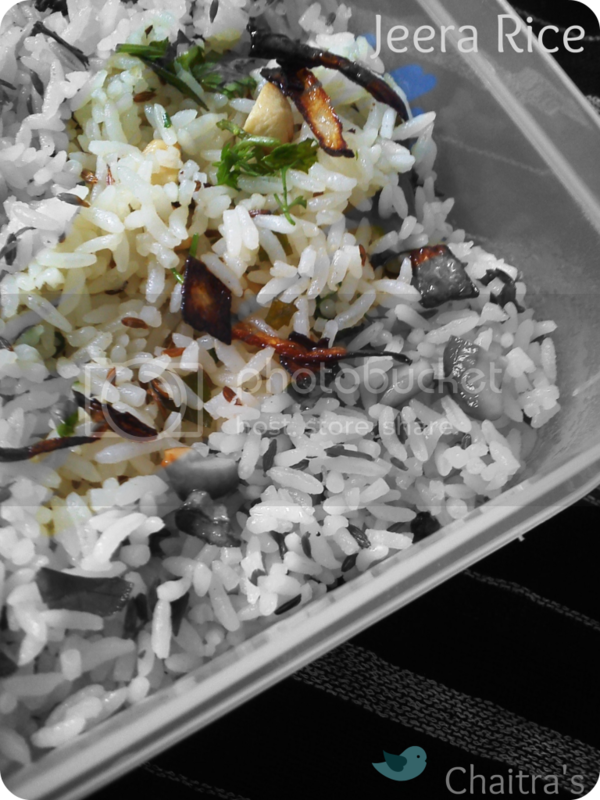 2) While cooking rice, adding 2 tsps of oil will ensure that rice doesn't stick. 3) You can add chopped onions after frying spices. Its optional and doesn't enhance the taste. 4) You can add a pinch of sugar which elevates the taste. P asked me if I can cook something in Chinese on a lazy Sunday. I love Chinese food and would love to order Chinese when we hangout at any restaurant. All I knew in Chinese was that Chilly Paneer and Chinese Noodles. P wanted something different from the regular Chinese that we eat.. I really had to scratch my brain, because Chinese to me revolves around noodles and saucy gravies. My only saucy gravy was Chilly Paneer (On a side note, my Chilly Paneer was a massive hit in my previous company Bank of America and I am visiting someone over this weekend and they want me to prepare Jeera rice and Chilly Paneer... Yay.. I feel elated about my cooking skills)Coming back to penning down the story behind this crispies....I had to put my head to work and think what else could satiate his craving for different Chinese. My local supermarket brings limited vegetables and I can't expect broccoli, lettuce etc.. It was just like that Sanjeev Kapoor's Master Chef challenge. I was angry both at P as well as the supermarket vendor for their choices. I did write a feedback but that doesn't satiate the challenge in front of me.. Finally I chalked out a menu of my own. Good Heavens!! P liked it. I had Baby corn Crispies for starter, babycorn and vegetable fried rice and vegetables in garlic sauce. Preparing them on a single burner stove is tedious yet times but when the comment comes out as Amazing. You are relieved and you forget that 3 hours of preparation and back end processing that you do. I will be posting Vegetables and Garlic Sauce along with Babycorn veg fried rice later. 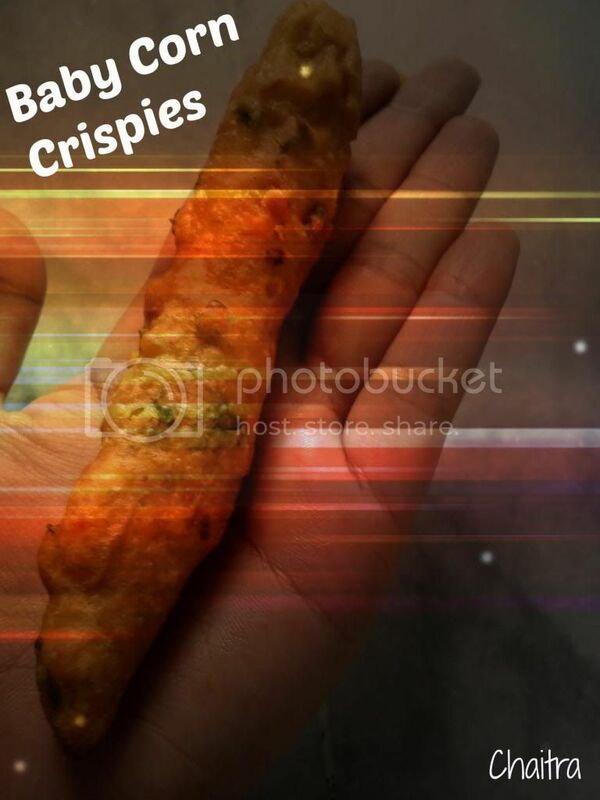 For today lets munch on Golden Fry Babycorn crispies. Green chilly- 1 chopped finely. 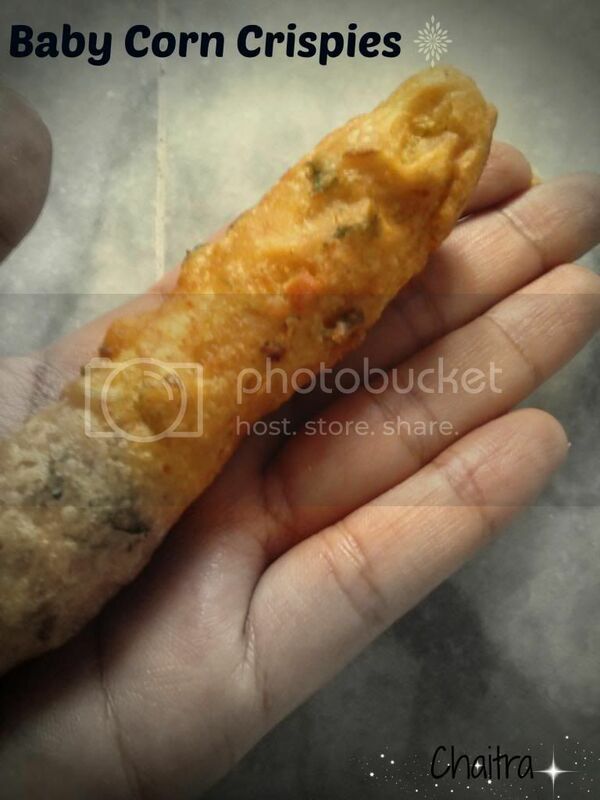 You can either cut babycorn lengthwise or use them as whole. I used babycorn as whole. 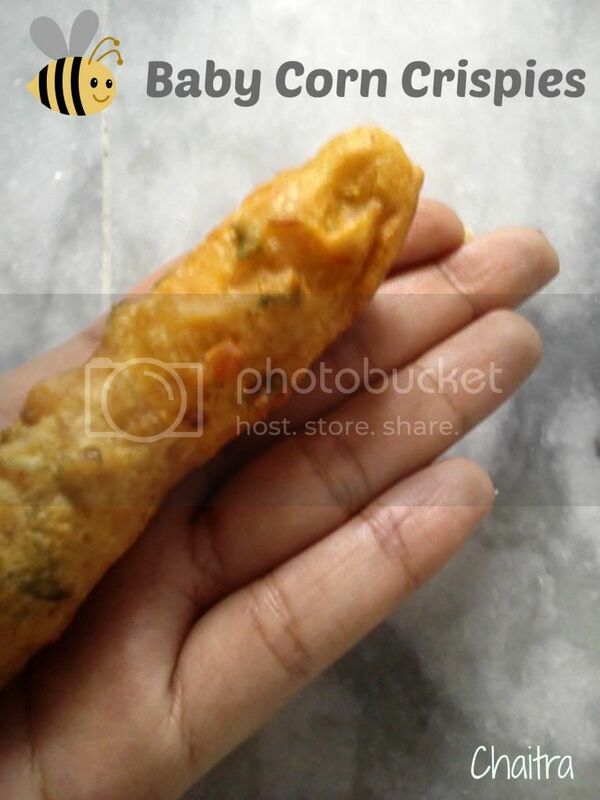 Bring babycorn to boil in water by adding a pinch of salt and turmeric. Remove them from water and squeeze babycorns gently by pressing with your hand. Ensure that they are not broken. Take a bowl and all the ingredients required for batter into it. Add water as required while mixing the batter. Consistency should be like thick idly batter. It shouldn't be too thick that you will be unable to roll babycorns in the batter or too thin that the batter and baby corn separate once you put them in the hot oil wok. Be little cautious in this step and next time I will take a picture for you folks. Take a heavy bottomed vessel and heat oil as required for deep frying. Coat each baby corn on all the sides by dipping them in the batter you've prepared. Drop these coated babycorns carefully in hot oil. Fry them until golden brown and repeat the same process for the remaining baby corns and remove the golden fried babycorns onto an absorbent paper. Serve hot with Chilly Tomato sauce or Sweet Chilly Sauce. I have used the batter ingredients roughly without any measurements. You can adjust them as per your choice. You can add finely chopped onions and ginger to the batter to give extra zing and thereon go ahead with your creativity by adding ingredients as per your choice but without disturbing the actual recipe much. You can give bread coating instead of this batter. Take 2 slices of bread and wet them with water. Cover babycorn with this bread and seal all the sides and fry them in hot water. This absorbs excess oil and I would'nt prefer too much of oil. I went to the supermarket to purchase things needed to run a week.I usually love shopping on weekends and dont really like to buy for the whole month. I do this to keep myself occupied over the weekend. I felt that my daily quick fix options have drastically gone down... May be because the veggies available with my vendor are not to my liking or its that a new job with Deloitte and the excitment is still on mind exploring the new things or the new shift takes sometime to adjust and balance myself....Coming back to the supermarket thing, I realized that its been a while that I cooked something Desi,the moment I saw some Mothi Beans, Double beans and Rajma on the Dals/pulses section. I have never experimented with these variety beans ranging from small to extreme big called double beans... I haven't heard infact. Green chillies - 1-2 chopped finely. Soak rajma/red kidney overnight n water. Heat oil in a pressure cooker and add all the spices for 1-2 mins or till slight brown in color. Add ginger garlic paste and fry till the raw smell subsides. Once ginger garlic paste is fried, add onions,green chillies, tomatoes and saute them for 2-3 mins. Now add kidney beans and the remaining masalas into the pressure cooker. Pressure cook until 2-3 whistles. Once the pressure is removed. Heat Oil in a pan and bring this mixture to boil and adjust salt if required. You might need to adjust the masalas. So feel free to do that if required. Add fresh cream and coriander. Cook on low flame for additional 3-4 mins. Transfer the contents into a serving bowl. You can garnish with Aloo Bhujia and fresh cream. I have used Aloo Bhujia and oats just for the color contrast. Adding Aloo Bhujia, onions and sprinkling lemon juice on Rajma masala will substitute for chat which is really healthy and doesn't need any accompaniments to eat... Its 2 go with one shot. 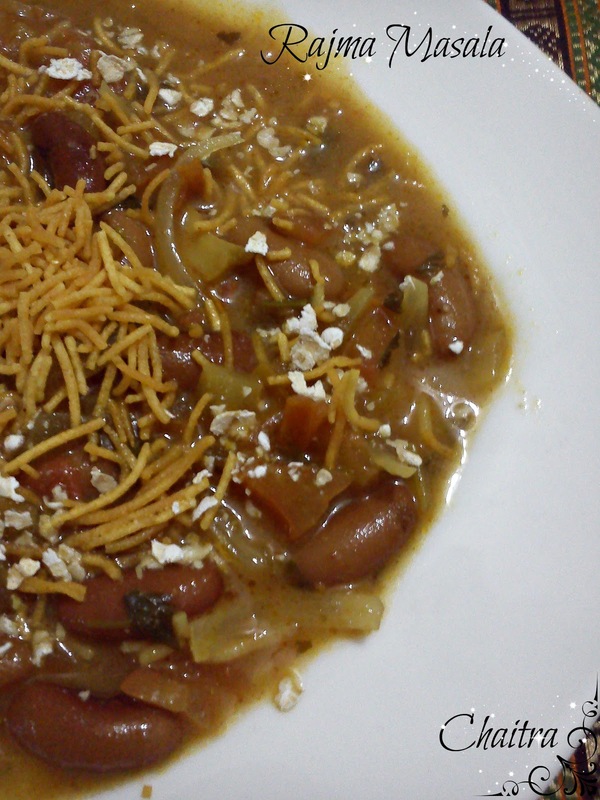 1) I have pressure cooked Rajma beans and the whole mixture until 2 whistles. I would need to increase it to 3 whistles to get nice gravy consistency. 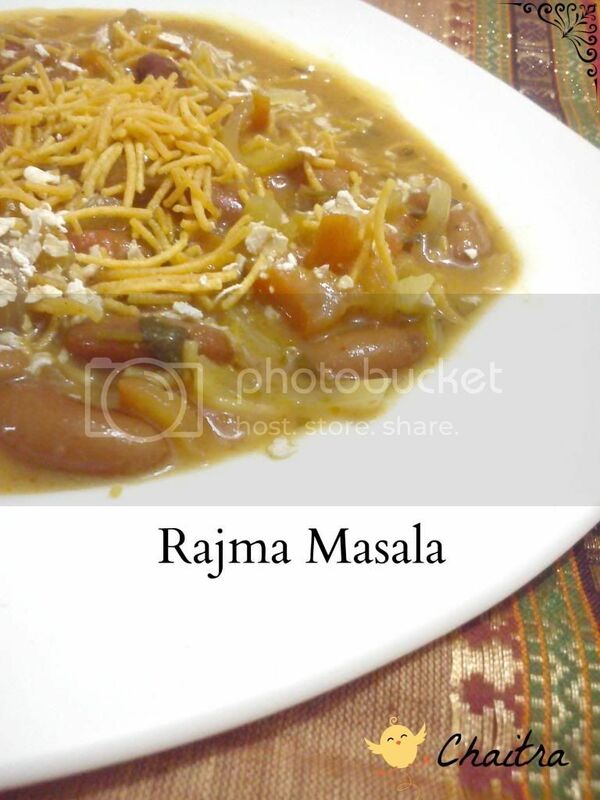 2) Alternatively you can pressure cook only Rajma and then remaining all the ingredients can be done in a pan and then rajma can be added at a later stage. 3) I have pressure cooked all the ingredients together, so that the flavors sink inside the beans well. 4) You can use tomato puree instead of tomatoes. I found that Hommade(Dabur's) was too sour for the gravy. May be you can try to balance it using one chopped tomato and 2 tsps of tomato puree.